August 26th, this day has significant meaning to me and my family. A year ago today is when this whole roller coaster ride began. It is hard to believe that it has been a full year now since we first heard the words, “very small preemie,” “heart defect,” “IUGR,” and “Down syndrome.” In some ways I feel as if it were yesterday as I can easily recall even the simplest details of the day as I have played them in my mind so many times. In other ways it feels as if I have lived a lifetime since that day. For some it may not be the most interesting post I’ve ever written but I’ve told people that at some point I would share the story of that day and the upcoming week. It can be tough as I relive those memories and the feelings that accompany them. It is also very therapeutic as I write them and see the journey we have made it through by His love and grace. So the following are my memories of that day. On Wednesday, August 26th, TJ and I headed to Tulsa for a routine checkup where I would get more ultrasound pictures and begin scheduling the more frequent visits that mark the third trimester. 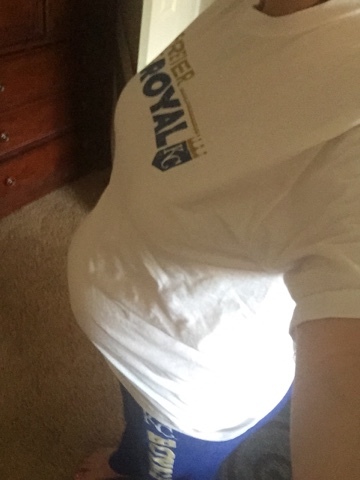 I was officially 28 weeks along that day. I was dreading drinking the awful drink that every pregnant lady dreads when it's time to test the blood glucose level for gestational diabetes. This visit had originally been scheduled for the previous Wednesday but the doctor had to reschedule so while I got to put off my glucose test one week I was ready to see how our little boy we had decided to name Kaleb was doing. As we got into Tulsa and drove by Saint Francis South where Kaden had been born we commented that we would be getting admitted there before we knew it and began talking about how fast the pregnancy was going and wondering how labor would go this time. I joked that I had a feeling this one was going to be ornery and I could see him coming early unlike his brother. As usual despite our best intentions we had to hurry in so that we would check in on time for appointment. Of course there was a line and even though it was our fault we were cutting it close I became antsy in my game of beat the clock. Only to find out that my doctor had been called out for two deliveries. I was to be seen by the physicians assistant instead. I was fine with that, I liked Megan and it was just a typical visit and ultrasound. It did make me remember the last time I had her for an appointment which was when I came in when I was experiencing my first miscarriage. She had been the one to tell me it wouldn't be a viable pregnancy but I worked now to shake the memory from my mind. We quickly got called back and led to an exam room. Dr. Rapp was just on his way out for the two deliveries and popped his head in to say hi and that he’d see us in three weeks. After having the lab draw and going back to the exam room the Megan came in to perform my ultrasound. Instead of small talk about Kaleb or the reassurances that everything was looking good, it quickly became apparent something was wrong. It began by her asking my due date as she thought maybe she had the wrong due date. Flashbacks to the last time I saw her as she performed the ultrasound and asked me if I was sure of how far along I should be as it wasn’t measuring up. My heart began to accelerate as she tried to calmly tell me she was going to remeasure him. After performing the various measurements she admitted he was measuring two to three weeks behind his due date. The baby that had at every appointment measured right on track for his due date was all of a sudden two to three weeks behind. I quickly realized that five weeks ago he measured typical for his due date had not grown very much at all in the five weeks since. I began to fear for my baby as she worked to keep a poker face in place as she explained that she would be taking a look at the blood flow. While she worked to hold the poker face you could tell it wasn’t looking good either. She soon confirmed my fears as she left the room to go call Dr. Rapp and discuss with another doctor in the practice. She was only gone about five minutes but in those five minutes I had to work to keep it together. I had never been one for panic attacks but I felt as if I was on the verge of panicking and losing control and I tried to will her back to the room and give us some answers. TJ and I both sat in shocked silence and we realized our carefree day had suddenly taken a different tone. When she did appear she didn’t give us many answers except to tell us that we needed to head to Saint Francis hospital and be admitted for monitoring. While I worked to hold my emotions together TJ went into problem solving mode as he hurried to the car already on the phone making arrangements for Kaden who was still in Bartlesville at daycare. I told him I need to go to the restroom before leaving, primarily to give myself a minute to collect myself and gear up for whatever lay ahead. As I made my way out of the restroom Megan was waiting for me at the door. “There’s been a change in plans. Dr. Jones is waiting for you at his office. You are to head straight over there,” she said with tears in her eyes. We didn’t know what to say during the few miles to the fetal maternal specialist office. The lightheartedness of the afternoon had suddenly been replaced by a fear that gripped both of us. I was trying hard to not think about the text messages that had already dinged on my phone from my mother asking how my appointment had gone. We were led to an ultrasound room where we had a 35 minute ultrasound. An ultrasound that I couldn’t wait to be over so we could find out what was going on but at the same time didn't want to end because as long as I was getting the ultrasound and I could see him moving and could see his heart beating on the screen I felt that he had to be okay. I stared at his heart watching each beat on the screen wishing I knew what they were looking for. I tried my best to make out each feature and would quickly try to read anything she typed. I ran through in my head the little bit of knowledge that we had been given and wondered what they meant for our baby and our future. After the ultrasound we were led to a room to await the doctor. We were both tired of waiting for answers. Luckily the doctor quickly came in. He wasted no time with small talk and began by telling us that Kaleb had a heart defect. He believed it to be a full AV canal defect and he would continue to monitor it. That if it were a full AV canal defect it would require open heart surgery. He then went on to say that this meant he had an increased chance of being born with Down syndrome as this type of defect is very common in children with Down syndrome. As if that wasn't enough to try and take in telling us that we would be having a very small preemie. He then began to throw out terms such as blood flow and IUGR. He explained the difference between absent blood flow and reverse blood flow. I was having absent blood flow IUGR which meant that blood was not flowing through the umbilical cord as it should so it wasn’t allowing him to grow and develop. We would be monitoring to see if it became reverse blood flow which is what Tulsa Women’s Health Care believed was happening when they sent me over. Reverse blood flow would put us on the clock as it would cause fetal death within a number of days. We would be having a preemie, it was now just a matter of when. It was a balancing act of when it was more beneficial to stay in the womb vs when it became to detrimental. I was now to be doing what I could to help develop him as much as possible before they had to take him. My job at that moment on was to lay on either side to allow optimal blood flow. Only getting up for bathroom breaks and a shower a day. I would have to be monitored twice a week until they determined it was time to deliver. I was to be monitored this frequent due to the blood flow that could turn to reverse blood flow therefore putting us on the clock as well as the fact that he was already so far behind now and by their best measurements was only appearing to weigh 1lb 13oz. I was told that I would get the first round of a two shot set of steroids that day to try to help give him a better chance. We were to return the next day to take the MaterniT21 test and get the second steroid shot. We headed home in a state of shock. Gone was the lighthearted conversation that had filled the car on the way to Tulsa. Gone was the life we had known before. It seemed ironic that just hours before we had been guessing at when Kaleb would decide to make his appearance. Now we were simply hoping we would take home a baby at the end of this. In truth we still didn’t feel as if we had a good grasp of what was going on. All of a sudden many new medical terms had been hurled our way and we couldn’t yet grasp their meaning or significance. We continued to drive back home to Bartlesville and to go pick up our two year old. With not knowing what the future held for Kaleb I was suddenly very ready to hold Kaden in my arms. I felt I needed to physically hold one at least one of my sons and feel his closeness, to see that he was safe. As we drove we would go back and forth between speechless, nervous chatter, and preparing a plan of attack. We pulled into our close friends, Courtney and Dalton’s drive way where Kaden was busy playing with their son, Carter. It was a relieve knowing that while our world felt like it had been rocked today that it had yet to affect Kaden and to him it was simply a chance to go to Carter’s hours to play. Of course there was no escaping Dalton and Courtney who still had no idea what was going on. I tried to sort out my thoughts and figure out how to explain what was going on when I still didn’t quite understand. I explained that with the type of heart defect that he had that it was common with children with Down syndrome so that meant he had a higher chance of having Down syndrome. While that was part of today’s story the more pressing matter was the blood flow. When TJ and Dalton got back with food everyone seemed to remember I was now to be doing my part of developing Kaleb and was to be laying on my side. So it began, the independent always busy person had to let that go and be still in hopes that I was doing everything in my power to give Kaleb a fighting chance. Wow, what a story this is - it's riveting. Thank you so much for sharing! I cannot imagine the feelings you went through that day, but the fact you were able to press on and hold it together comes to show that there is nothing you can't handle! Your boys are so blessed to be yours - what an amazing mother you are.